Who likes to be under the weather? No one! 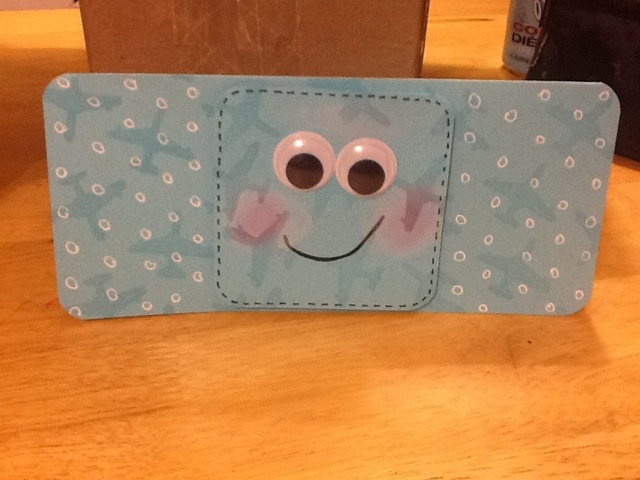 This card was made using recollections card stock. While I was trimming the card to fit a no. 10 envelope I also trimmed the "pad" for the front. After stamping the airplane with Versamark; I drew circles all over with a white signo gel pen. I rounded all corners with a corner chomper. Using tombo mono to glue the google eyes into place. I used pebbles dry chalk to make the cheeks rosey and a liquid fine liner for the stitching and mouth. This card was fun to make and easy to make a few at a time, if needed. Hope everyone stays warm, safe and germ free! Oh, how cute is this!?! My little one fell down at school the other day, and was so sad I wasn't there to take care of her... would have loved to have this cute card on hand to give her! Love it!